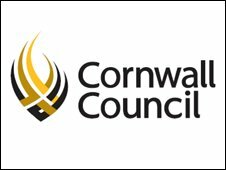 A logo for Cornwall's new unitary authority has caused more controversy, this time over the motto underneath it. The options being considered are Onan Hag Oll (Cornish for "One And All"), or Building A Better Future. The logo has already been criticised for its design, likened to boxing promoter Don King's hairstyle, and cost, an estimated £476,000. Critics said the Cornish motto was an attempt to make it more acceptable to Cornish people. Cornwall's new unitary authority will replace the six district councils and county council from April 2009. Based on the shield from Cornwall's ceremonial crest, the new logo replaces the existing design for Cornwall County Council, featuring a miner, a fisherman and a chough (a type of bird). Graham Hicks, leader of Kerrier District Council, told BBC News: "They might feel that it is more acceptable with a Cornish motto, but I do not think it is. "It's a sop to the Cornish, trying to get them on board. "I support the use of the Cornish language because we have a duty to promote it, but I also believe we should be listening to the people and I do not hear anyone who is supporting this logo." Pol Hodge of the Cornish Language Partnership said: "It's a cynical political move to split the Cornish speaking and English speaking people. "But as the motto says, we are "one and all" and it does not change the fact that the logo is a pile of rubbish." The new authority, called Cornwall Council, rejected the criticism. A spokeswoman said: "Straplines are a way of encapsulating what an organisation stands for - an organisational statement which sets out the organisation's vision. "It is excellent practice to have such a vision and set of values. "It makes it clear to staff, councillors and residents what the council is working towards, and will help us create a high performing organisation."